, a neat little toy we’ve cooked up to show you photos and blog posts as you’ve never seen them before. Shortly after Blogger launched photo uploading two years ago, one of our engineers whipped up a web page that would show us the pictures that were being uploaded in real time. The result was fun, often beautiful, but above all, compelling. We couldn’t stop watching. 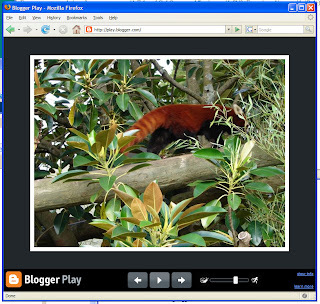 Blogger Play will show you a never-ending stream of images that were just uploaded to public Blogger blogs. You can click the image to be taken directly to the blog post it was uploaded to, or click “show info” to see an overlay with the post title, a snippet of the body, and some profile information about the blogger who uploaded it. We also wrote a Blogger Play FAQ with more information. A caveat: we use many techniques, including Google’s SafeSearch technology, to keep the images clean. Nevertheless, on rare occasions an image that you may find vulgar or obscene will slip through our algorithmic filters. Google does not pre-screen the images that appear in Blogger Play, nor is it responsible for their content. To report a terms of service violation, you may fill out this contact form. Today we’re pleased to launch Blogger Play, a neat little toy we’ve cooked up to show you photos and blog posts as you’ve never seen them before.